Must be a Filipino citizen, at least 18 years old. The Certificate of Business Name Registration is valid for 5 years and shall be valid only at the business address indicated thereon. In the event the registered owner thereof should opt to open branch offices within the Philippines, he must apply for separate registration for each of the branch office so established. National Capital Region Business Center: AREA I- Manila, Pasay, Paranaque 2nd Flr., Park and Ride Lawton, Manila Tel. No. 536-7153 AREA II- Makati, Pasig, Pateros, Taguig, Muntinlupa, Las Piñas Unit 208 2nd Floor, Atrium Bldg., Makati Ave., Makati City Tel. No. 864-0847 or 864-0829 AREA III- Mandaluyong, Marikina, Quezon City, San Juan Ground Floor Highway 54 Plaza, Mandaluyong City Tel. No. 706-1767 or 706-1703 AREA IV- Caloocan, Malabon, Navotas, Valenzuela 5th Floor, Araneta Square, Monumento, Caloocan City Tel. No. 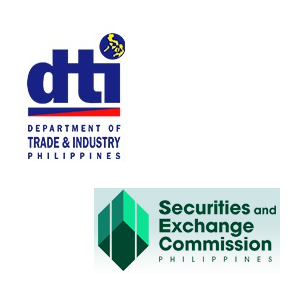 362-7664 or 332-0854 For businesses outside of Metro Manila: Proper DTI Provincial Office where business is located.